Brodie William Koch, 23, of Stevens Point, died peacefully at home after a recent illness on October 17, 2018. Brodie was the oldest survivor of a very rare condition known as Toriello-Carey Syndrome. Brodie was born on February 11, 1995. He was a resilient fighter from the get-go and was the oldest son of Paul and Nancy (Zdroik) Koch. 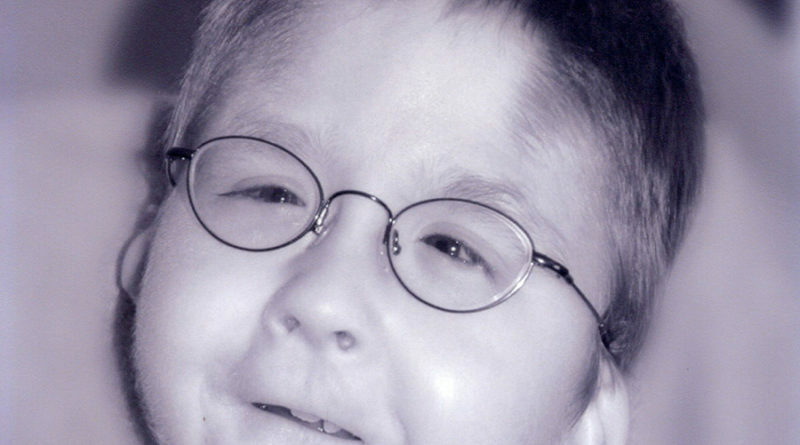 Brodie’s special needs endeared and connected him with multiple nurses, therapists, doctors, social workers, and friends. His family loved and cared for him deeply no matter how challenging Brodie’s path in life became. What many people would initially perceive as weakness and significant hardships for such a frail young man, over time actually proved to be his greatest strength. Brodie’s crowning achievement in life was his capacity to love others…unconditionally. Anybody connected to this gentle soul became a better person just from knowing him and relating to his numerous smiles and infinite, trusting patience. Brodie especially enjoyed: music, being read to, mylar balloons, fireworks and family vacations to anywhere! Being with family was his favorite. Brodie is survived by his parents, Nancy and Paul; and siblings, Rosalinda and Mateo; paternal grandparents, Les and Marianne Koch; maternal grandmother, Jane Zdroik; aunts and uncles: Dave and Maria Koch, Tom and Rhonda Koch, Julie Koch, Bob and Amy Zdroik, John and Lynn Zdroik, Jim and JoAnn Zdroik, Chuck and Karen Zdroik, Joe and Lynn Zdroik, Rick and Edie Zdroik, Clare (Zdroik) and Kevin Cullen, Greg and Shannon Zdroik; and numerous cousins and friends. He was preceded in death by his paternal grandfather, Eugene Zdroik. Brodie’s family would like to extend a special thank you to his entire staff of in-home nurses and Dr. Wiersema who dedicated themselves to providing for Brodie’s many needs with compassion and respect. A Funeral Mass of Christian Burial will be held 2:00 p.m., Friday, October 19, 2018, at St. Peter’s Catholic Church. A time of visitation will precede in the Faustina Room from 12:00 noon until the time service; with a rosary beginning at 1:30 p.m. Burial will be in Guardian Angel Cemetery. Online condolences may be made at bostonfuneralhomel.net.